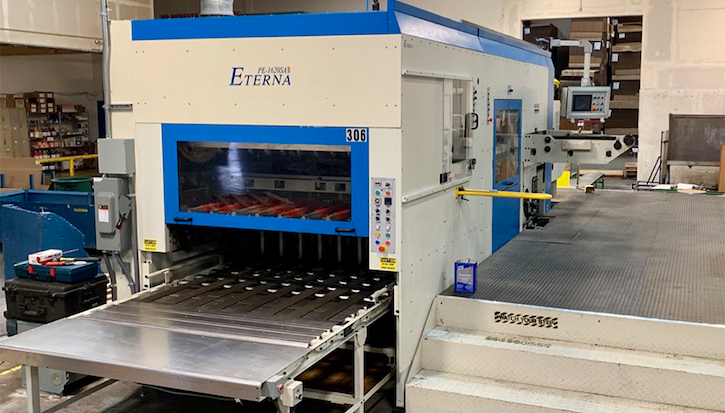 The BoxMaker, a Pacific Northwest leader in custom packaging solutions, has announced the purchase and installation of an Eterna Maxcut Auto-Platten Die Cutter, the latest in a series of investments made by the company to enhance their manufacturing capabilities and efficiencies. With an operating speed of 5,500 cycles per hour, this additional piece of machinery offers increased production speed and improved setup time, allowing The BoxMaker to address client orders with greater efficiency and agility. Designed to accept material sheets with a blank size of up to 46.5 by 63 inches, the Eterna Maxcut is able to die cut larger boxes and corrugated structures, allowing a significant portion of product orders to benefit from this machine. One of the most exciting features of the Eterna Maxcut is its 3-stage stripping section, which enables complete removal of waste and trim from the final die cut product. 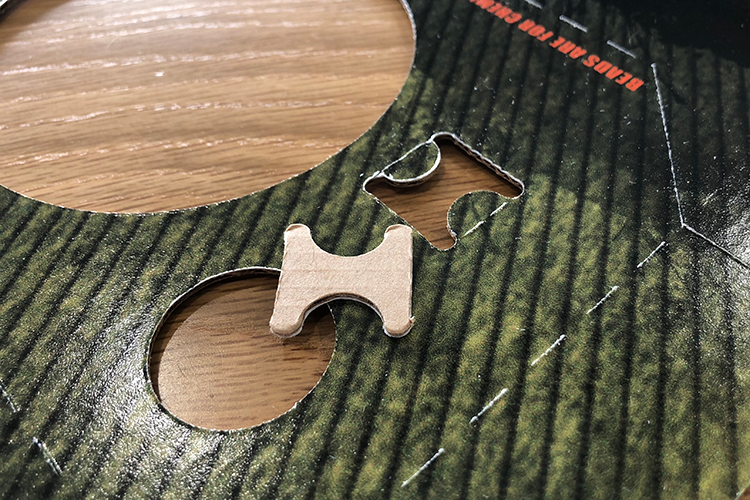 By fully removing all intricate waste during the manufacturing process, The BoxMaker eliminates the need for hand labor on these orders, not only in their facility but also for the end user. Boxes and displays die cut on this machine ship free of waste and are ready to be assembled. This reduces production time and increases efficiency for both The BoxMaker and their clients alike. Example of intricate waste that must be removed from a box. "Our clients expect high quality packaging to deliver a brand message,” says Kristi Duvall, Vice President of Sales at The BoxMaker. “Adding the Eterna will provide improved quality and efficiency, resulting in shorter lead times and will eliminate those little pieces to discard at fulfillment." The Eterna Maxcut is currently being installed at The BoxMaker’s manufacturing headquarters just south of Seattle, Washington, and will begin full production by October 5, 2018. As an all-in-one packaging partner, The BoxMaker strives to provide custom solutions that amplify their clients’ people, processes, and brand. This investment is the latest in a series announced by The BoxMaker, including the purchase of an HP PageWide C500 Press for digitally printed corrugated, and the first-of-its-kind robotic board handling system installation for their Zünd automated die-less CAD cutting table. By consistently investing in machinery and workflow upgrades such as these, The BoxMaker continuously provides best-in-class products and services that deliver a competitive edge to their clients. Follow The BoxMaker on social media for more news and updates on the Eterna Maxcut Die Cutter: Facebook, Instagram, Twitter, LinkedIn.